HEEEYYY theree you proud AMDAVADI’s, didn’t you feel a sense of Pride and Valour when you came across this NEWS?? Well, Well, we’ve decided with all our hearts, to Honour this Prestige of our City with a very unique, mesmerizing and deep-rooted bunch of hereditary musicians !! That rings a bell? Did you step back to the WAR? Something way beyond 1947? The BORDER? The Mirs of Pugal (northwest Bikaner) live in villages scattered along the border between India and Pakistan. 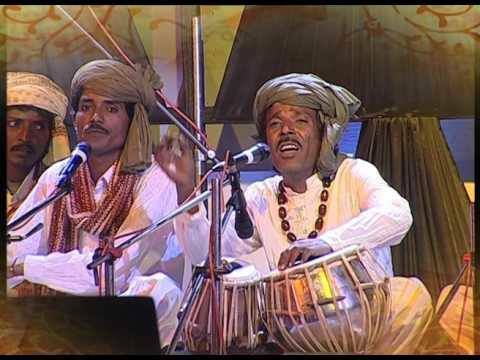 They are hereditary musicians who have been singing the kalaams of Baba Bulle Shah, Baba Farid, Shah Hussain, Shah Abdul Latif, Khwaja Ghulam Farid and other Sufi poets for hundreds of years. Originally from Pugal, now living in a small hamlet called 1 PB (Pugal Branch), Vasu Khan is a talented youngster with a unique voice and a deep commitment to carrying on the 500 year old tradition of his people. He learnt music from his father, Late Ramzan Khan, a reputed singer of the region. He got an opportunity to hone his talent in a Music camp that the Mirs organized in March, 2006. Using the stipend money he received, he built a small Music Room in his village where he is teaching children from his community. Mir Abdul Jabbar has been a trailblazer in the arid desert landscape of Pugal. Despite economic hardships he took to rediscovering their tradition of singing sufiyana qalam, firming it up and singing it to the outside world. For most of the outside world Pugal had been arid backwaters where nothing grows and the devouring landscape is a stalking ground of drought and drudgery. With remarkable ingenuity these musicians have belied this paradox of aridity and creativity. INDO-PAKISTAN BORDER. Bikaner. Mir Musicians. WOW !